METAIRIE, La. -- The New Orleans Saints have released tight end Coby Fleener just two years into his five-year, $36 million contract. Fleener's departure isn't a big surprise, considering he caught only 22 passes for 295 yards and two touchdowns in 11 games last year before finishing the season on injured reserve with a concussion. The Saints actually turned back the clock in free agency by re-signing Benjamin Watson, whom Fleener replaced in 2016. It's unclear why New Orleans waited until May 7 to release Fleener, but it's possible that they were waiting for some sort of medical clearance. If Fleener had been medically cleared before the new league year began in March, the Saints could have saved his full $6.4 million in salary and bonuses by releasing him. Instead, $3.4 million of Fleener's salary was guaranteed for injury. Fleener was released Monday with a "failed physical" designation. The Saints designated Fleener as a post-June 1 release, a move which will save the team about $2.5 million against this year's salary cap, with another $3.2 million in "dead money" counting against their cap next year. 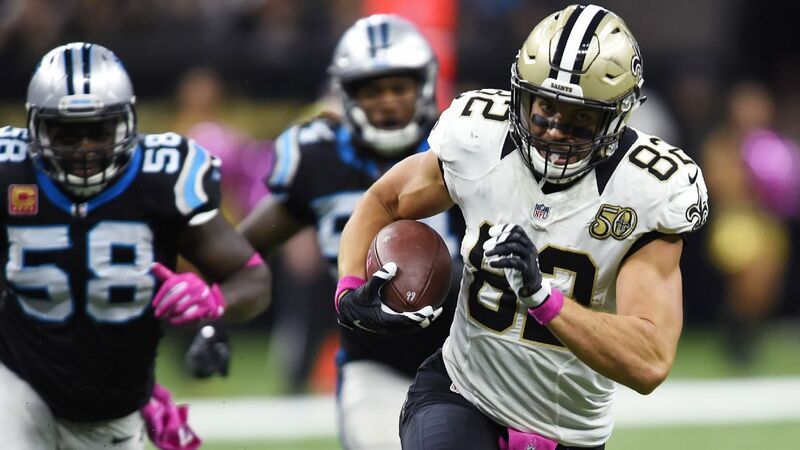 Fleener, 29, and the Saints seemed like a good match in 2016, since he is primarily a pass-catching tight end and New Orleans' offense has been so friendly to tight ends like Jimmy Graham and Watson in years past. But the 6-foot-6, 251-pounder never developed into a consistent playmaker for the Saints. Fleener had 50 catches for 631 yards with three touchdown catches and one touchdown run in his first year with New Orleans in 2016, before his role decreased last season. The Saints made tight end a priority this offseason, pursuing Graham before they decided his price tag was too high and turning back to Watson, 37, instead. They also have veterans Josh Hill and Michael Hoomanawanui on the roster, and the position should become an even bigger priority next year. Fleener spent his first four years with the Indianapolis Colts after being drafted in the second round out of Stanford. He has 255 catches for 3,080 yards and 23 touchdowns in his six-year career. Fleener told NOLA.com last season that he had suffered four football-related concussions in his life before the latest one. He has also been heavily involved in concussion research and safety efforts. So it will be interesting to see whether that affects his decision to keep playing.